Honda Debuts Tech That Can See Around Buildings. Here Is How It Works. Honda Debuts Tech That Can See Around Buildings. Here Is How It Works. Honda rolls out new vehicle communication tech in Ohio to reduce intersection collisions. Research shows intersection collisions are increasingly common and dangerous. Smart Intersection technology and subsequent systems play a role in the success of autonomous cars. Honda is taking their next steps towards a driverless portfolio with the introduction of Smart Intersection technology. Honda says it enhances vehicle-to-everything (or V2X) communication, and can reduce deadly intersection collisions. According to the United States Department of Transportation, 51 percent of all injury crashes and 28 percent of all fatal crashes occur at either an intersection or T-junction. Recent data from the National Safety Council suggests roadway deaths this year may climb as high as 40,000. V2X communication, like Honda’s Smart Intersection technology, uses proprietary object recognition software via intersection-mounted cameras and other communication devices. 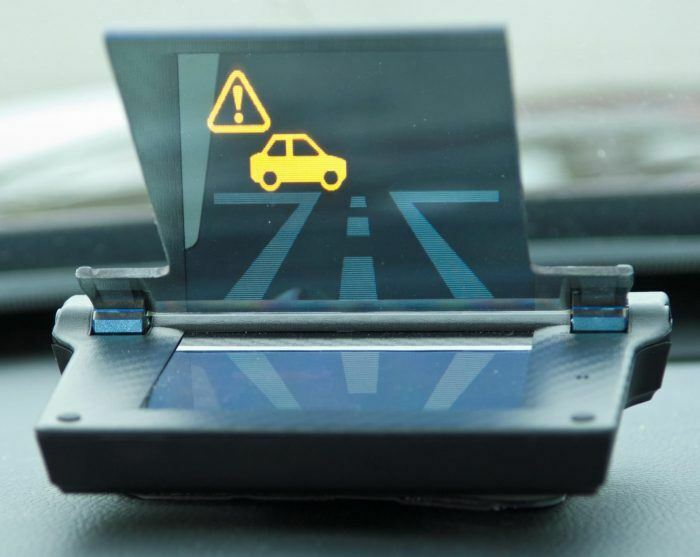 This allows cars to “see” around and through buildings, walls, traffic, and even bad weather. Drivers then receive an alert to notify them of otherwise hidden hazards. “Honda believes that V2X technology is an essential component of a smarter and safer transportation ecosystem and can play a role in our dream for a zero-collision society,” explained Ted Klaus, Vice President of Strategic Research, Honda R&D Americas, Inc.
Smart Intersection technology is a joint venture between Honda and Marysville, Ohio as part of the 33 Smart Mobility Corridor project. The pilot program will address the limitations of current on-board vehicle sensors with regard to preventing intersection collisions. 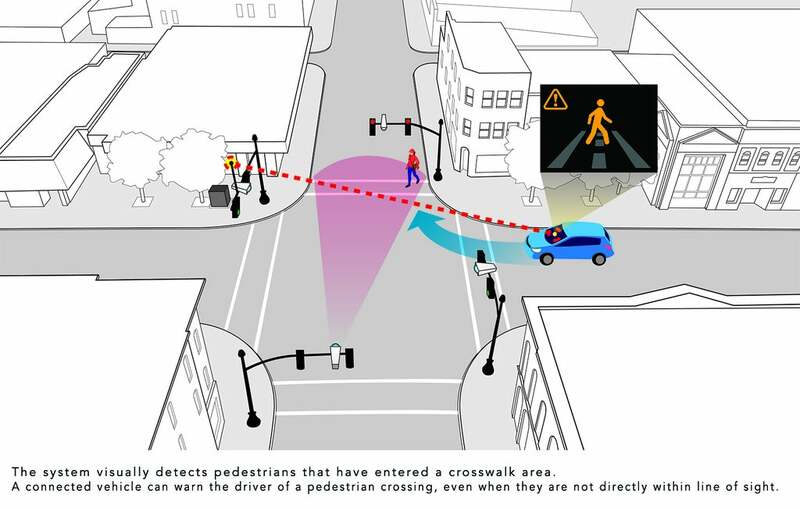 Honda’s Smart Intersection technology detects an oncoming vehicle running a red light. Photo: Honda North America. Four cameras above the traffic lights at each corner of a given intersection provide a bird’s-eye view of the surrounding area. Honda says the cameras have a range of 300 feet to detect vehicles and pedestrians from farther away. The image processing software creates a 360-degree image of the intersection that classifies vehicles and other moving objects. That information is then broadcast to surrounding vehicles via a dedicated short-range communication (DSRC) signal. Each connected vehicle’s on-board computer decodes the information and, when necessary, provides visible and audible alerts to the driver. With this information, the driver has the ability to take corrective action to avoid or mitigate a collision. 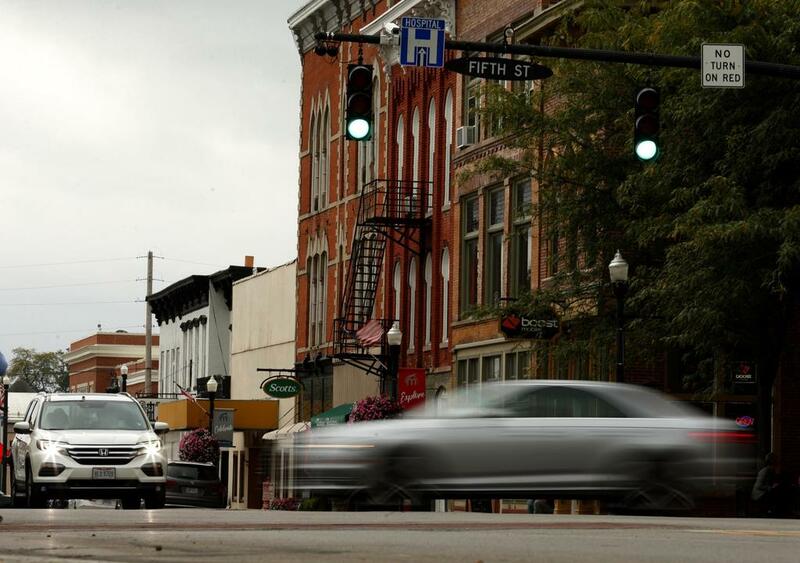 Thus far, Honda has committed 200 vehicles for Smart Intersection testing. “We believe this research will give us a better understanding of how V2X technologies can be further advanced and most effectively deployed for the benefit of all road users,” Klaus said. V2X is a viable solution when it comes to safety and autonomous cars, something consumers are wrestling with. Honda is showcasing Smart Intersection technology not a moment too soon; Hyundai and Autotalks announced a V2X-centered partnership in July, while back in June, Cadillac said their Super Cruise system would serve as a springboard for future V2X features. Consumers could see such features as early as 2023. 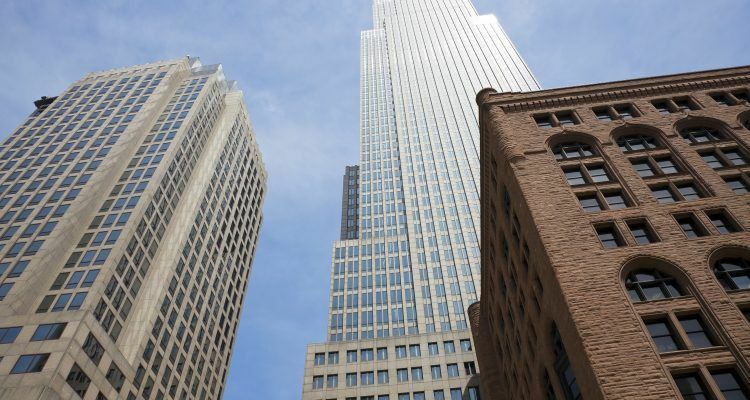 Continental, a Tier 1 Supplier, unveiled a similar technology last year. While promising, nothing is here just yet. And until cars chauffeur us entirely, law enforcement officials recommend all motorists practice defensive driving. No Comments on "Honda Debuts Tech That Can See Around Buildings. Here Is How It Works."